The lamina of the cervical spine serves the same purpose as the lamina of the lumbar spine. It is the protective roof over the cord and spinal nerves. Arthritis, bone spurs, bulging or herniated discs can start to squeeze in like corrosion building up in a pipe and irritate the cord or nerves. 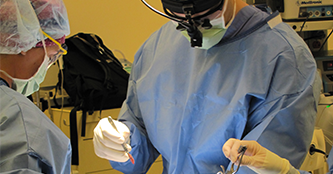 The purpose of the laminectomy is to remove a small portion of the lamina to take pressure off the nerve or cord and stop the pain The procedure is done from the back of the neck using minimally invasive techniques as an outpatient.